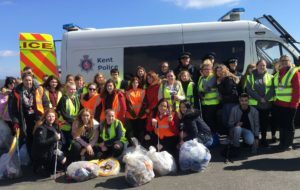 Students from East Kent College hit the streets of Broadstairs with bags and litter-pickers as part of The Great British Spring Clean. The volunteers with some of the rubbish they collected around Broadstairs. April 5, 2019 in Media Releases.